Dark Granite shiner of Petrolux is suitable for the treatment of the polished dark granites. On the polished surfaces is applied for darkening the surface and to eliminate possible superficial micro-porosities and web-cracks. 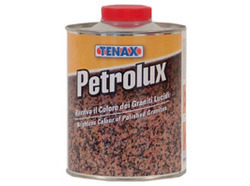 This Petrolux Dark Granite Shiner is suitable to increase the colour and the polish effect. In all the cases the application increases the polish effect and increases the colour. Very easy to apply and remove, it is recommended for automatic waxing lines. The product has a poor protective effect of anti-stain. Incorporated in the year 1996, in Mumbai (Maharashtra, India), we, “Om Enterprises”, are recognized as prominent trader, distributor and supplier of an optimum quality range of Sealants, Epoxy High Adherence System, Glucing & Filling Products, Polishing Stone and Surface Processing. These products are procured from some of the licensed and trustworthy vendors of the market. The offered products are used for filling holes, cracks & joints on black Italian marble & black granite. Our products are processed using premium grade chemical compounds and advanced technology at our vendor's end in conformity with the defined universal standards. The offered products are highly cherished among clients for their precise composition, purity, effectiveness, safe to use and long shelf life. Besides this, we offer these products in varied packaging options in order to satisfy variegated demands of our clients spanning all over the world.